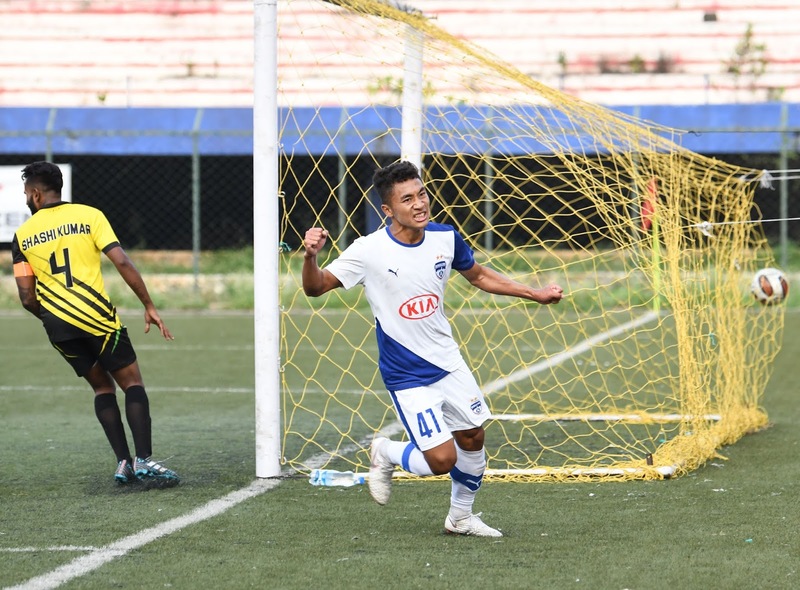 Bengaluru FC recorded a fifth consecutive win in dominant fashion as they brushed aside Bangalore Eagles 5-1 in a Round-7 encounter of the BDFA Super Division League at the Bangalore Football Stadium, in Bengaluru, on Friday. A brace each from Leon Augustine (35’, 64’) and substitute Lalnuntluanga (87’, 90’) after skipper Myron Mendes’ (20’) opener handed the Blue Colts their sixth win of the campaign. The result meant Naushad Moosa’s boys took their tally to 18 points after seven games, extending their lead at the top of the table to eight points. The game began on a sour note when Edmund Lalrindika was withdrawn after a tackle down the flank saw the Blue Colts’ striker unable to continue. Bengaluru broke the deadlock in the 20th minute as Altamash Sayed’s free-kick from the right was headed home by Myron at the second post. The Blue Colts then doubled their advantage in the 35th when Leon struck from close range after left-back Parag Shrivas did well to keep the ball in before sending a low powerful cross into the box to Leon who timed his run well for a finish that creeped in at the far post. Bangalore Eagles pulled one back early on in the second half when a flailing hand from Parag in the BFC box caught a cross and prompted the referee to point to the spot. Striker Gopi levelled the scores with his penalty in the 50th minute. However, it was the Blues Colts who restored their two-goal cushion when Leon completed his brace in the 64th minute. Myron, with a delicate chip, found Leon making a run into the box on the right, and the winger found the back of the net at the far post on the volley. Striker Lalnuntluanga, on for Edmund in the first half, struck a brace late on to complete the rout. Biswa Darjee was the provider on the first instance, setting Lalnuntluanga up with a perfectly threaded pass in the 87th minute. On the stroke of regulation time, the striker scored his second, poking Leon’s aerial ball past an advancing Abhishek in the Bangalore Eagles goal, before slotting home from close. Bengaluru FC will next face Bangalore Independents on Tuesday, December 11.